Such a wicked and delicious thrill ride! And the ending!!! I did not see that coming. ‘The Perfect Girlfriend’ was a completely chilling yet totally compelling book. Stalker, anyone? Juliette is the very definition of the word. Her former boyfriend Nate may have broken up with her but she will stop at nothing to get him back. I listed to the audiobook which was a fantastic way to get inside the head of the main protagonist. An unreliable narrator for sure, yet Juliette’s past at least makes her a little more human. Juliette makes herself over, from a new job to a new name, all with the goal of getting Nate back. She trains to become a flight attendant at the same airline where he works as a pilot (and the insider’s view of the lives of flight crews was totally addictive). She knows that she and Nate belong together and she will stop at nothing to convince him, too. All she wants is to live happily ever after with the love of her life, Nate. This was a thrill ride from beginning to end. The story made me very uncomfortable at times but what could be better? Every friend, every conversation, every trip was all planned in advance by Juliette with the goal of getting Nate back. She will not be ignored. Juliette even secretly installs a tracking app on Nate’s phone to keep tabs on his every move. The author and narrator did a spectacular job of making me keep listening to find out exactly who was going to come out on top in this strange tale. And the ending simply stunned me! I still don’t think I fully understand what happened but I loved it! Juliette had one goal in mind and never strayed from her attempts to make Nate see that she was the perfect woman for him. 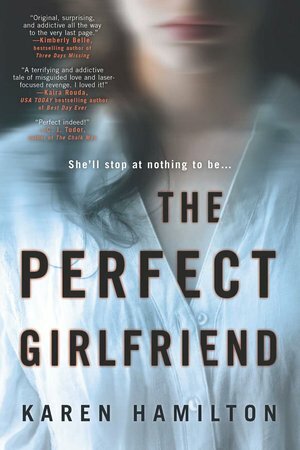 Filled with dark humor and psychological suspense, ‘The Perfect Girlfriend’ was a fantastic debut thriller from Karen Hamilton. I was on the edge of my seat for the entire book, waiting to see what scheme Juliette would come up with next. The author even made me feel slightly sympathetic for Juliette’s plight. The only thing keeping this from being a 5 star read for me was the other abrupt ending. I derived a certain thrill from most of Juliette’s plans and actually laughed out loud at some of her observations. Karen Hamilton has written a very original thriller with an unforgettable protagonist. I can’t wait to see what she comes up with next! Highly recommend this one for all fans of psychological thrillers.